08-05 | Rapid/fast MRI • Magnetic resonance imaging | NMR MR MRI | Essentials, introduction, basic principles, facts, history | The primer of EMRF/TRTF. Reduced Acquisition. Instead of acquiring, for instance, 256 lines, we acquire only 80% and zero-fill the remaining lines. We loose some of the spatial re­so­lu­tion, but for many clinical applications, the raw data are sufficient (Figure 08- 09a; cf. Figure 07-07). Halfscan. In this case we acquire an asymmetrical fraction of the data set. The rest of the data are replaced by the symmetrical data from the other side of k-space. 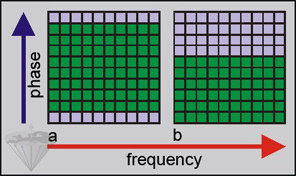 Spatial resolution is maintained, but there is a loss of signal-to-noise (Figure 08-09b). (a) The k-space data set in reduced acquisition. (b) The k-space data set in halfscan. Slightly more than 50% of k-space is collected. Rectangular Field-of-View. The final MR image can be turned into a rect­an­gu­lar image by collecting only half the lines in k-space. By doing this, image time, as well as the field-of-view, will be halved, which is convenient for imaging of the extremities and the spine, or in angiography (Figure 08-10). However, the sig­nal-to-noise ratio will also be substantially reduced. k-Space Substitution. To accelerate dynamic image data acquisition, one can apply k-space substitution, also called ‘keyhole’ imaging [⇒ Jones; ⇒ van Vaals]. This technique collects the entire k-space of a reference image; for the sub­se­quent images, however, only the central lines are recorded. These data are then combined with the outer lines of the reference data space to add information on edge definition and sharpness. In this way, the uptake of a contrast agent can be followed very rapidly (Figure 08-11). 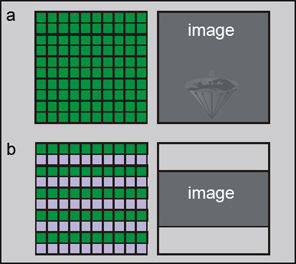 (a) The entire k-space of a reference image before contrast injection is collected. 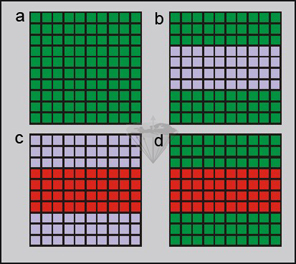 (b) For the dynamic part of the study, the cen­tral part of the reference k-space is re­mo­ved. (d) are combined with the reference data afterwards. Spiral (Helical) and Radial Scanning. 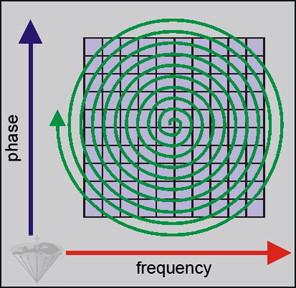 Alternatives to filling k-space line-by- line are spiral (helical) or radial scanning techniques (Figure 08-12). These me­thods are very fast and therefore suited for dynamic imaging and, e.g., for car­diac imaging. They use projection reconstruction (backprojection) algorithms as described earlier. Spiral k-space filling. Usually one starts by acquiring data for the center of k-space. Spiral filling can be performed in a single shot or interleaved as a multi-shot tech­ni­que. Multi-shot techniques have a higher spatial resolution. Chapter 8: Rapid/fast MRI - Page 5  Go to Chapter 8, page 1, 2, 3, 4, 5.